How Can I Help My Child with Transitions? 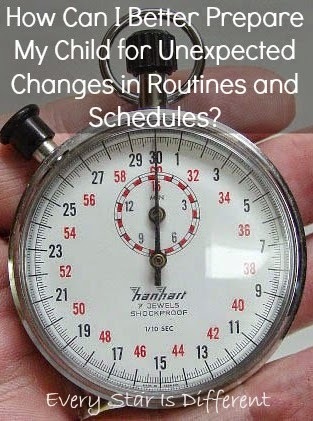 How Can I Better Prepare My Child for Unexpected Changes Routines and Schedules? Today I am super excited to welcome a new writer at Every Star Is Different. We are moving onward and upward. I want to make sure to give you, my readers, everything you could possible want, all in one place. Nothing will be taken away. Weekly units will still be shared for tots, preschoolers, and K-3rd Grade with free printables for everyone. I'll still be writing personal parenting experiences. 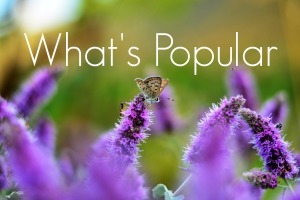 Special needs and sensory posts will always pop up now and then. The Kids Learning Printables Linky Party will continue. My new writer has a master's degree in Marriage and Family Counseling. This person has spent the last eight years working as a therapist to adults and children, in a private and group counseling sessions, and in residential facilities. At home, this person has four plus years experience as a foster parent, caring for children ages newborn to eighteen years of age with multiple special needs. This person is also a parent to special needs children. If this person doesn't seem amazing enough already... Within the last year, this person was diagnosed with Autism Spectrum Disorder, ADHD and Anxiety Disorder NOS. I am always amazed at the perspective this person gives me when I talk about kiddos' behaviors I'm struggling with. On a more personal note, this person is brilliant. Whenever I need encouragement, love, or support, I can always count on it. 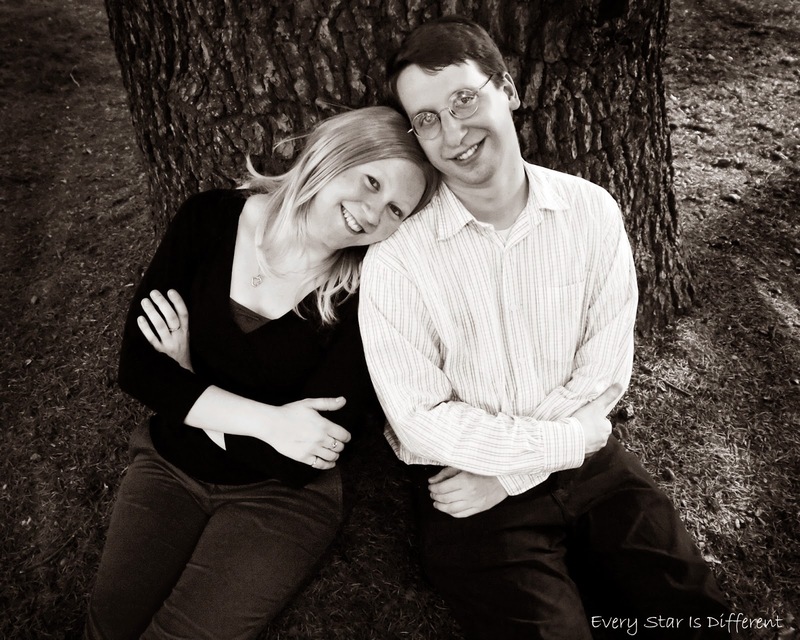 This person is my biggest fan and helps me so much with everything I do on this blog. He is my best friend. He is my husband. Welcome Jason! Each week Jason will be posting an answer to one question submitted by readers, in regards to their children, special needs, parenting etc. You are welcome to submit questions by email at renaemarienae@gmail.com or through a message on facebook. Questions will be answered in the order they are received. 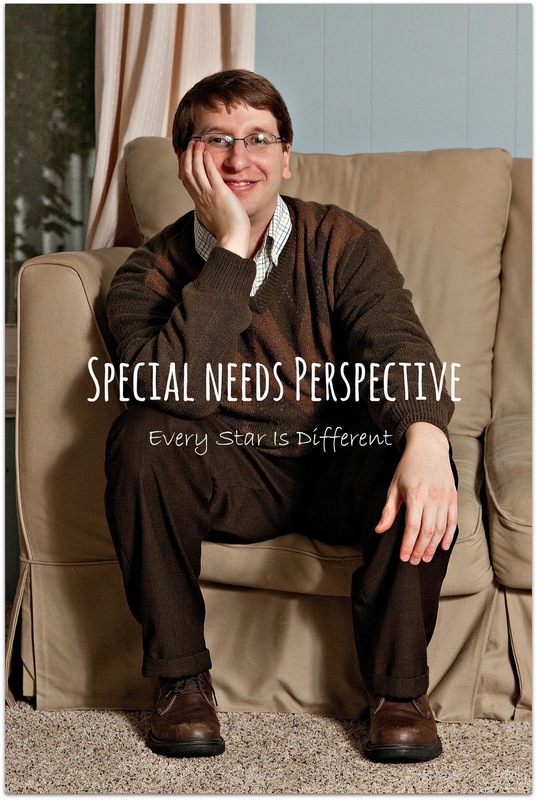 Thanks to Renae (The Mommy of Many Hats) for inviting me to contribute to Every Star is Different. As Renae noted in the introduction, I have been recently diagnosed with Autism Spectrum Disorder (ASD) along with ADHD and Anxiety Disorder NOS. As my kids were diagnosed (before I was), my priority was meeting their needs and finding my role in that process. I was excited and determined to do this, but I found it very difficult to manage even the smallest tasks and behavioral issues, without becoming frustrated, overwhelmed and sometimes, angry. So, while the news of my diagnosis was not exactly a "career highlight", it did bring relief, understanding, and hope for better things to come. There was now a reason why I was struggling so much, and with that, new ideas about how to overcome specific challenges. So, what can you expect from my posts here? Hopefully, the best thing I can offer is some perspective. I hope to combine personal experience with my professional counseling training. Disclaimer: Any advice or suggestions that I write here CANNOT be considered therapy or professional consultation, due to counseling ethics standards. It is not really practical or possible to do counseling with someone I have never met. What I hope to offer IS my personal experience as a person with ASD, AHD, and Anxiety Disorder NOS, combined with experience as a parent of special needs children, plus the things I have learned as a professional counselor. Take any advice that fits, leave aside what doesn't fits. How can I better prepare my child for unexpected changes in routine and schedules? Changes in routine and schedules can be planned or unplanned, but either way, they present a major problem for people with ASD, OCD, and other related disorders. On the surface, the issue seems to be about schedules and routines not being the way they "need" to be. Certainly, structure and routine help reduce anxiety and ease transitions for people with ASD. They can become overloaded by sensory input and need to know what to expect to calm themselves down. This need for order can become rigid however, so much so that any disruption can result in major meltdowns or emotional "shut-downs". The basic solution to addressing this issue is preparation, whenever possible. Making a plan as far in advance as possible with the child's input (if possible), should help reduce some of the anxiety around the change of events. For example, in the case of a child who struggles with a shortened day or "half-day" at school, discussing the day's schedule, (both in-school and after-school) should help to defuse some of the pent up anxiety about the upcoming change. Providing some sort of incentive or favored activity right after the shortened school day would also help. Depending on the communication skills of the child, try to get as much input from the child as possible. As you communicate with the child, you may find that the problem goes beyond just the disruption of the day. Personally, I remember feeling both excited and slightly perplexed and anxious about shortened school days. On the one hand, go home early (hooray! ), but on the other hand, I wondered what it would mean for the flow remainder of the day. Would lunch (or study hall, etc.) be shortened or cut out all together? It wasn't enough to ruin my whole day, but if I was especially looking forward to an afternoon subject or class (or lack thereof...) it could generate a little disappointment and resentment. So, when discussing the schedule change with your child, I would explore a little further to see if the anxiety comes from not knowing what the day will be like or if it's about missing out on something that usually happens later in the day that your child looks forward to. In the event of an unplanned schedule change, or one that you haven't prepared for ahead of time, the first thing to do is plan for an unpleasant reaction from your child. You know it's coming, so ride it out and take the time to plan out what you are going to do next. If it involves cancelling a favorite activity or event, talk about the things that "have to happen" next, for as long as it alters the expected schedule, and when the schedule will resume as usual. If there is a plan to play outside, which needs to be cancelled due to weather or an appointment last minute, explain the change in detailed plans, what will happen instead, and when the regular schedule for the day will resume. Again, think about incentives. If there is a last minute appointment, bring along the tablet with the child's favorite apps loaded up, as a reinforcement for good behavior and managing the change/transition well. Bulldozer will do anything for more iPad time. Personally, the biggest challenge for me is managing the emotional content that is bound to follow the news that the plans have changed. I feel more anxious around these times due to the increased volume of those around me, the hectic pace of getting ready with little to no preparation, and the overall heightened emotions in general. So, it is important as a parent to be aware of your emotional and sensory state, as well as being in control of how the children perceive your emotional state. Take a deep breath. Breathing is good. Rushing around frantically, telling your child to hurry up is going to have the opposite effect you want it to. Schedule changes are some of the trickiest, yet most common, sources of behavioral and emotional blow-ups among people with ASD and other special needs. Preparation, planning and communication with the child, all basic things that a special needs parent does everyday, are the most important skills needed to minimize the damage, and result in new learning and growth for the child, as well as improved trust and bonding for the parent and child. You can do it! It's our pleasure! We love the chance to share with others what we've learned through experience, parenting, career, and educational backgrounds. Your family is amazing!! Your perspective as both a parent of children with special needs as well as a person who has gone through many of the issues yourself certainly makes your insight "real". My children are adults, but looking back I suspect that one may have had some type of special needs. The comments about handling changes in routine sure hit home. Thank you Shirley. I'm glad to be of help! Thank you for such great words of wisdom! Every parent will benefit reading it! You are very kind. Thanks for supporting this. Thanks so much for joining in the Parenting Tips linky on Tantrums. This is a great post for helping us prepare as best we can for those little changes that make a lot of difference. Thanks for hosting it. I hope we can contribute more to your linky party soon. Thank you for reading! I'm so glad you enjoyed it! You're welcome. Come check us out again next week.